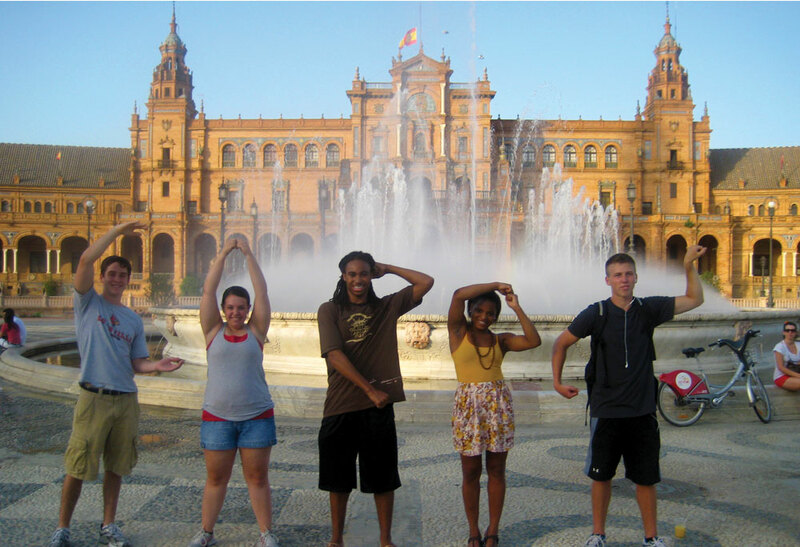 It is hard to believe that I am already halfway finished with my program here in Sevilla, Spain. Time has flown by due to how busy I have been exploring the city and traveling on the weekends. Since my last post, I have visited Italica, Cadiz, Jerez, Cordoba, and Granada. Each trip is filled with history, adventure, and of course fun. I would like to start by talking about visiting Italica and Cadiz. Italica is a little town about 30 min. outside of Sevilla that is famous for its Roman ruins. It was a nice day trip in which I was able to learn more about Roman influence in Spain. The ruins consist of pillars, foundations of houses, and some walls. The ruins were once a bustling town that was home to people who farmed the land during the week, and went to the ampitheatre on weekends to take in the sites and sounds of gladiators battling. The amphitheater was extremely impressive and looked like a mini coliseum. On the other hand, Cadiz was a completely different experience. I went to this city on the Atlantic coast for Carnival. Cadiz is host to the biggest Carnival celebration in Spain, and it is very similar to what we think of when we think of Carnival or Mardi Gras. However, one major difference is that everyone dresses up in costumes for the celebration. Think mixing Halloween with Mardi Gras and you have Carnival in Cadiz. Next let’s talk about Jerez and Cordoba. Jerez was a nice day trip as well as it is only 45 minuets away from Sevilla. Jerez’s claim to fame is that it is the home of Sherry wine. It is a quaint little town that I visited for a few hours with some friends. Cordoba was much more interesting. The main attraction in Cordoba is La Catedral Mezquita. As is very common in southern Spain, the site where this building resides changed hands between the Moors and Christians over its history. It was first a Visigoth Church that was then demolished by the Moors and replaced with an incredibly large and ornate Mosque. Finally when the Christians reconquered Cordoba they decided to build a Cathedral in the middle of the Mosque rather than destroy the beautiful architecture created by the Moors. The resulting building is an amazing feat of engineering and architecture. Finally, let’s talk about Granada. Granada is another beautiful city in southern Spain. During my time here, I visited the impressive Moorish fortress known as La Alhambra. The Alhambra was a beautiful place with scenic views of the the nearby Sierra Nevada Mountains and vast gardens. I also saw an authentic Flamenco show in Granada. The performers were full of passion and energy as they danced and sang for our entertainment. Flamenco is famous in southern Spain, and describing it with words doesn’t capture the dramatic and emotion filled performances that are its staple. The last thing I did in Granada was skiing in the Sierra Nevada Mountains. I am an avid skier back in the United States, but the only place I had ever skied prior to Sierra Nevada was Perfect North in Indiana. Needless to stay, it was quite a different experience. The views were absolutely incredible no matter what direction you looked. This included the view from the top of the mountain from which you could see the Mediterranean Sea and North Africa in the distance. The skiing itself was a blast as well, and I am happy to say that Perfect North prepared me well as I never fell during my time in the Sierra Nevada. In my next post, I will talk more about my experiences here in Sevilla with the locals and day to day life. Thanks for reading and adios until next time!